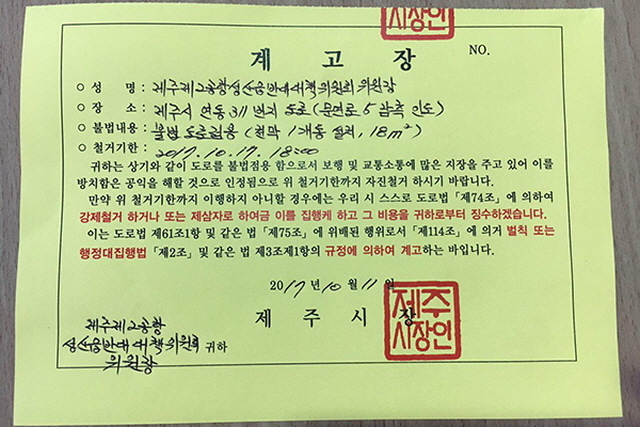 The Jeju Provincial Government has delivered a letter of warning to the organizations protesting Jeju’s second airport to demolish the tent where people are fasting to express their opposition. If they don’t demolish the tent by Oct. 17th, the government will forcefully dismantle it. Earlier, the Jeju Provincial Government recently requested that the Ministry of Land, Transport and Tourism build Jeju’s second airport, so people from the organizations decided to hold a fasting demonstration.